Jeff For Banks: The social responsibility of banks is to increase profits. The social responsibility of banks is to increase profits. Although Friedman remains highly admired, corporations continue to pursue the perceived virtues of social responsibility. Corporations are not people. They are fictitious entities. They are owned by their shareholders. Managers of corporations are not accountable to society. They are accountable to their owners. To engage in socially responsible activities for reasons other than serving your owners would be presumptuous. But can there be a middle ground? Must we subscribe to Gordon Gekko’s philosophy that “greed is good” in its rawest form? (see video clip) I believe there could be a middle ground. A society where corporations, in a free enterprise society, pursue goals that are both socially responsible and consistent with maximizing profits. Let me explain. 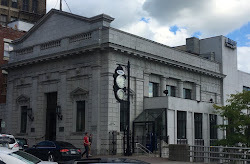 Franklin Financial Services Corporation, parent company for F&M Trust Bank in Chambersburg, Pennsylvania, invests in the Franklin Future Fund, a non-bank investment company that makes venture capital investments in the Cumberland, Franklin, Fulton, and Southern Huntingdon counties. Banks typically lend businesses money, and shy away from early stage businesses with no operating history (and no real estate as collateral for that matter) because of the risk of not being paid back. Franklin recognizes that new business generation is critical to the success of the communities in which they operate. New businesses evolve to better, more stable bank customers. They also employ members of the community. Although Franklin’s investment may not be consistent with maximizing profits in the short term, it certainly qualifies for executing a long-term strategy to grow surrounding communities so the bank may also grow and thrive. I applaud Franklin for their long-term vision, and encourage other financial institutions to participate in the success of budding businesses in their communities. In addition to attracting investors, ASB’s mission also attracts customers, particularly, Christian businesspeople. So its socially responsible mission has differentiated the bank from its peers in terms of attracting investors and customers. Has the tithe reduced the return to shareholders? 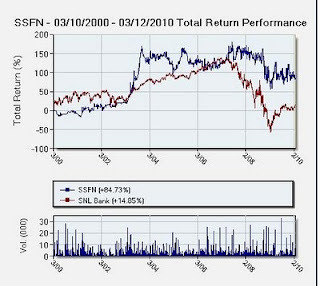 As the chart below indicates, Stewardship Financial’s (ASB’s parent company) 10-year total return was 85%, compared to 15% for the SNL Bank Index (see chart). ASB gave away 10% of pre-tax profits during that entire period. Has social responsibility worked for them? Could it work for you? I think Milton Friedman would agree that social responsibility could play a key role in differentiating you from competitors and enable you to maximize profits.